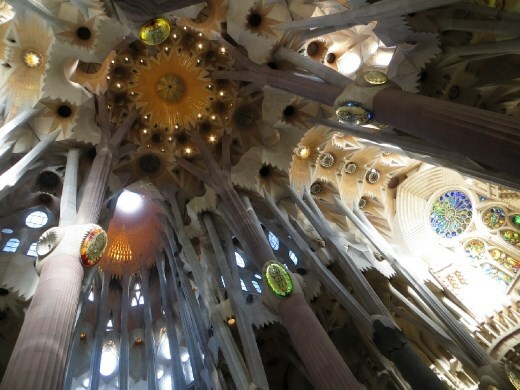 An insight into the unrivalled genius of Gaudi. How can a human mind even conceive of something like this? I'm speechless. As I was born with the gift of the gab though, there was only the briefest of pauses after that first sentence. I visited Gaudi's still uncompleted masterpiece, the Sagrada Familia, and I feel I need not go into another church again, nor want to. There is simply no way to describe the design or the effect of the place. I do love a challenge though, so with a delicious brewdog beer quickly emptying beside me, I'm going to have a jolly good crack at it. I prebooked tickets online to avoid queues, but something this popular is always going to have queues. Big ones. The biggest being the suckers who hadn't pre-booked, but I still had enough time to finish my Americano before being granted entrance through the line for smart bastards who plan ahead. That was a good opportunity to start deciphering the busy fascade that looked like a traditional church made of wax that had started to melt. The conical hexagon laced towers at the front proved this wasn't a conventional church, but just how unconventional continued to unfold throughout my visit like Russian nesting dolls. I took an obligatory selfie out the front, to prove I had been here and not downloaded photos of the place. The fascade hadn't given away any of its secrets so I hoped the interior might. Upon crossing the threshold, I almost felt myself become digitized. This was unlike anything I had ever seen before, and could only imagine seeing in the best designed computer games of our day. Well, not my day, as we considered any game more involved than getting a frog from the side of the road to the other side of the swamp as being futuristic. As construction started on this church over 100 years ago, and will continue until 2030, the inside shows no signs of age like all other European churches. Therefore, the newness of the surfaces adds to the hyper-realism of it. I didn't take more than 5 steps inside before simply stopping and gazing around in awe. This lasted at least 10 minutes, and still gave me no way in which to describe what laid before me. Stained glass windows to my left poured predominantly blue light in to combat the orange windows on the opposite side. There was no images on them, merely abstract shapes and forms that combined to describe a mood or a feeling more than a scene. I set my camera to semi automatic and wandered through the milling throng who were all doing the same thing. A clear sky outside ensured that I was getting the maximum effect and it was breath-taking. Prebooking tickets meant agreeing to a particular time of entry and my ride up one of the towers was booked in for 15 minutes later. I headed to the lift surprised but suspicious of why there was no queue. Like Notre Dame, my luck had run out again and no one was going up the towers due to the wind outside. Missing out on views of the city was disappointing, but I was still so dazed that I walked away from an attendant who was more informative than a 'technical reasons' sign without even hearing him describe how to obtain a refund. I felt the best thing to do at this point was to just sit down and stare. There wasn't far to walk anyway and I was staring upwards unblinkingly while half accidentally bumping into all the selfie sticks being waved around like a royal rumble fencing duel. There were seats in front of the main alter cordoned off for silent reflection and meditation. Little kids will wail and cry, Asian girls will giggle, and secular people will talk loudly not understanding the concept of sacred space so silence was not possible anywhere. Particularly with construction going on for at least the next 15 years. It was hard to hold onto any sort of peace when jackhammers were pounding and saws were grinding in the immediate surroundings. Once they stopped though, it was like someone bumping the stereo at a party and everyone went quiet realising how loud they were actually talking. Then they adjusted their volume and just keep talking anyway. The most impressive thing that struck me at this point was the almost complete absence of gory scenes. Christ was being crucified on the main alter, but as it hang some 4 metres above the ground with a halo of lights around it, his ascension was more apparent in this portrayal than his suffering. No where else was there a depiction of the atrocities so ubiquitous in every other church. This was almost as impressive as the building itself. The focus was leaning heavily towards symbolism and emotion rather than literal portrayal and comprehension. When so much of Christianity misinteprets a book of analogies and parables as fact, we have the world we live in today. Other churches can only dream of having the universal appeal of a place so broad in its language and so heavenly in its expression. I sat for an hour and watched attendants embody the very essence of Christian patience as ignorant tourists kept entering the area of silent reflection merely to get a better view of the roof. As at peace as I felt, I still wanted to take their selfie sticks and use it to take a photo of their small intestine from the inside. 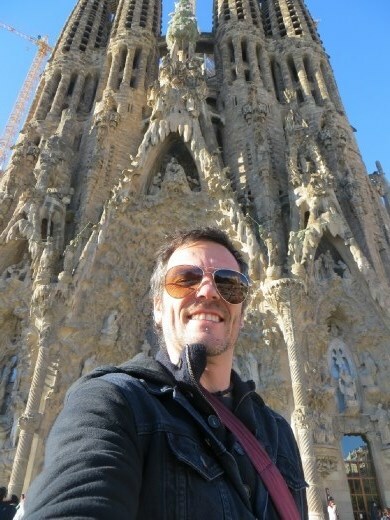 I still failed to unlock the buildings secrets, or the intentions of Gaudi, so I went in search of the museum. Time spent there reading into Gaudi's life and motivations is integral to understanding what is going on with the Sagrada Familiar. I had very little clue to the man or his methods, but his organic architectural style was abundantly clear from the other buildings I had seen. Once I grasped how closely Gaudi aimed to imitate nature, the more I saw how the building grew, and in doing so, how it grew on ones perception. 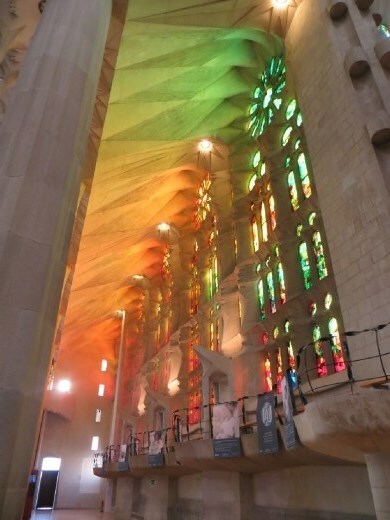 “The interior of the temple will be like a forest” Gaudi stated, and with that in mind, the true majesty of the design unfolded. The supporting columns split like the branches of a tree, strange bulbous shapes surround the intersection like errant boughs had been cut away. The criss-crossing shapes on the roof emulate leaves and accentuate the hyperbolic geometry that is used like its humanitys purest language. 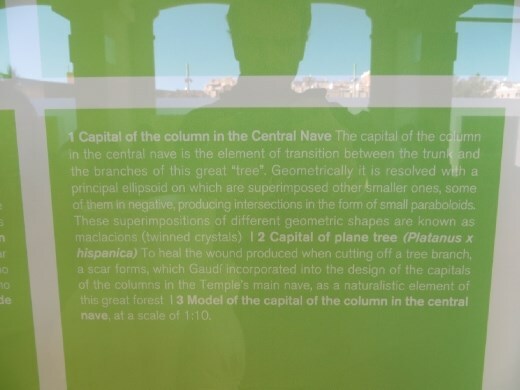 I cannot describe this better myself than how the Gaudi museum narrator does in the photo below. 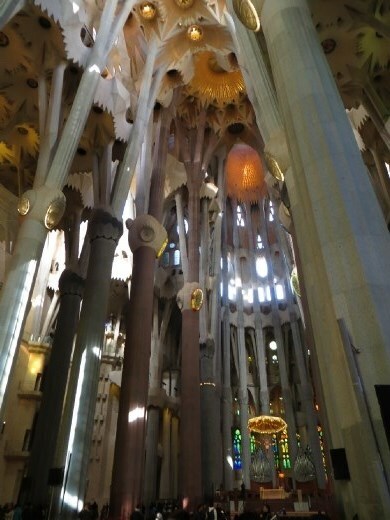 Even though churches are sacred spots dedicated to the connection between man below and God in heaven above, Gaudi had made the Sagrada Familia to be just as much a celebration of nature. It truly felt like being in a nest, or a hive, and was without doubt the best attempt I had seen at combining the physical world with an ethereal realm. It was out of this world, but very much of this world. By focusing what we would usually consider to be the mundane aspects of life around us, Gaudi has turned them into the supramundane. I walked out in to the bright blue day feeling like I had visited another realm of existence, and not taken any drugs to do so. On a trip where I have seen more impressive erections than at a Viagra convention, the Sagrada Familia is in a class of its own. And it's not even finished! With space on the balconies for a 1000 person choir, I hope I live long enough to return and hear Beethovens 9th or something similiar performed there. And because mankind has always tried to encapsulate spiritual ideals in consumable goods, I wanted some sort of souvenir to remind me of the time I whole-heartedly felt the true spirit of Christianity. With a construction timeline stretching over a century, bills had to be paid somehow, and a lot of that was being recouped in the souvenir shop. As many desirable things as I saw there, most of them would have resulted in a no beer budget for the rest of the trip. Sadly, I restrained myself and bought two bookmarks for 1.60Euro and rejoiced in leaving with my spiritual, and fiscal wealth, intact. Contemplating the profound experience I had just had over a bowl of steaming hot noodles. I was lucky enough to catch a hand that was slowly extracting my bag from the stool beside me. Turning towards the idiot the hand was attached to, I snatched my bag back as the dude apologised and straightened out the coat on the back of his chair like that had been his intention all along. His calm countenance lulled me into momentarily believing him, combined with my shock at his brazeness and it was only his hasty exit that made me reconsider his intentions. I scoffed my noodles and went outside to ruin any sort of spiritual enlightment by giving this guy a piece of my mind, or a piece of my fist. Unfortunately he was nowhere to be seen, but the divine countenance of the Sagrada Familias fascade was right in front of me and I was able to regain some equanimity before returning to life outside of the most incredible place I haven't needed drugs to visit.